A few hidden things in there, I really shouldn't have looked at the maze book in the waiting room! Almost finished the cover so I'll post soon. Wow, what a fabulous drawing, Debra! This is unexpected. The change of texture and colour are quite different and demand an extra look. This is SO awesome! I love the spools and the added touch of surrounding the toaster with them. You've inspired me! I really like this one, and the subjects together is great fun and something so different. 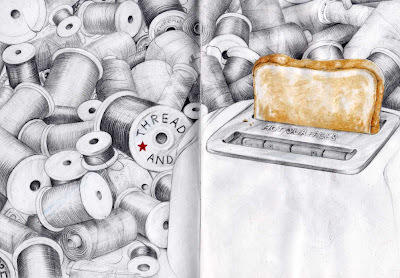 The texture of the smooth thread and the rough toast. Graet piece!! Wow--the spools of thread are just amazing!! Amazing work Debra....I am in awe!!! I just LOVE these spools...wow,,,a fab piece of work!! Incredible detail! Did you do this from imagination or from a photo? I loved enlarging this and looking for the hidden images! Is that a pop tab in there? brilliant! brilliant! brilliant! Please let us know when the entire book is uploaded to Sketchbook site.